Ti Kuan Yin is one of the ‘top shelf’ teas at Murchie’s, which means you can purchase 1oz at a time rather than 2oz (like the majority of their loose teas). I got this one when I popped into one of their Vancouver locations because I just wanted some more oolongs to sip and enjoy. Ti Kuan Yin has a very sweet, floral smell to the dry tea. The tea itself has this amazing green colour that I find difficult to accurately capture in photographs. 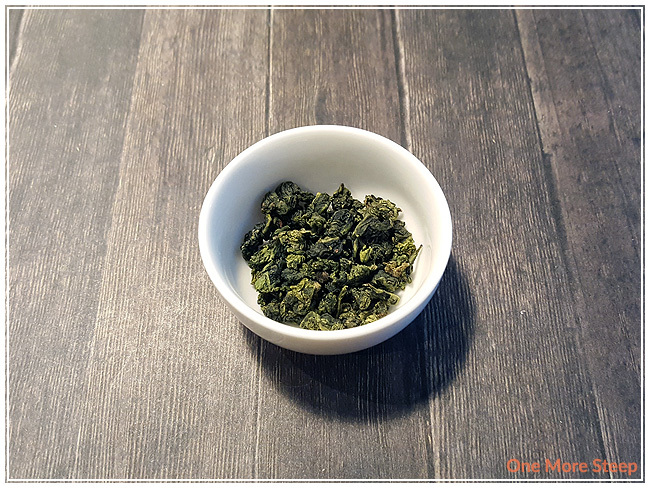 As a straight oolong tea, the only ingredient in Ti Kuan Yin Oolong is oolong tea. 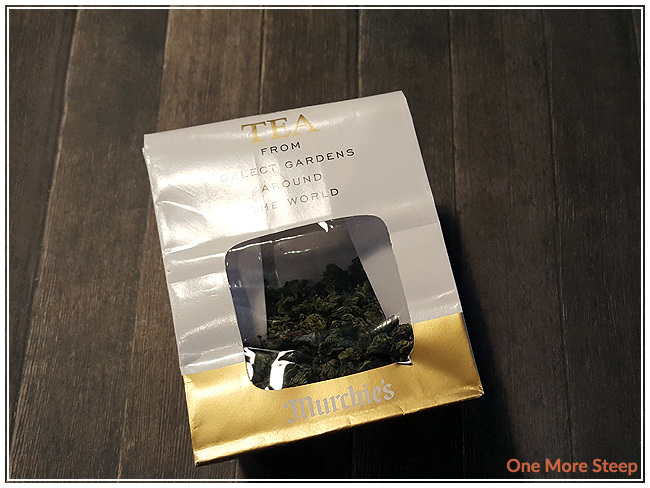 I’ve talked about Murchie’s loose tea packaging before, when I reviewed Canadian Breakfast. It hasn’t changed and is still informative with the steeping times and temperatures for each type of tea. I’m always a fan of having the information right on the packaging because it just makes life a little bit easier. Murchie’s recommends steeping oolong teas in 180-195°F (82-90°C) water for 2-3 minutes. I used my Breville IQ Kettle, which heats water to 195°F for oolongs. I steeped Ti Kuan Yin for about 2 ½ minutes. Ti Kuan Yin steeps to a very pale yellow. The floral notes in this tea really pack a punch because it’s the first thing that I notice – sweet floral notes that play well together. 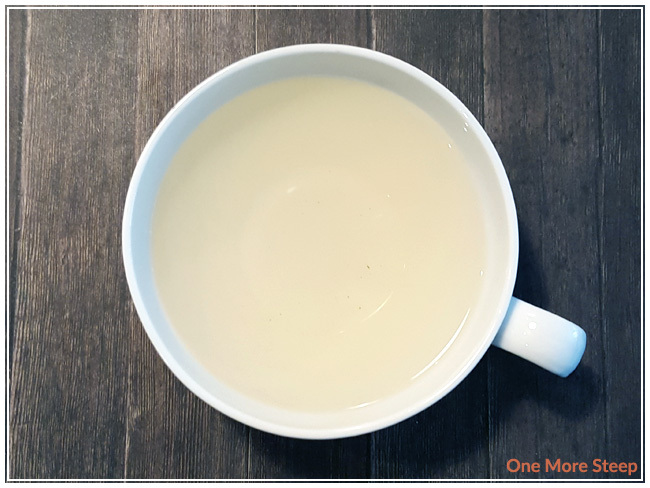 There is almost a creamy quality to the tea that reminds me of smooth butter, but it isn’t as strong as the floral flavour to the oolong that I do need to close my eyes in order to pick it out. At the recommended water temperature and steeping time, Ti Kuan Yin made for an enjoyable cup of tea. There was a nice smoothness, with just a little hint of astringency at the end of each sip that had a nice mouth pucker feel to it. There was no bitterness, and I feel like the tea would do very well for at least one more steep so that’s exactly what I did. I resteeped Ti Kuan Yin a few times (in total: 8 resteeps, so 9 steeps in total for the same tea leaves). Each steep I steeped for an additional 30 seconds (3 minutes, 3 ½ minutes, 4 minutes, etc.) until the last steep (6 ½ minutes). 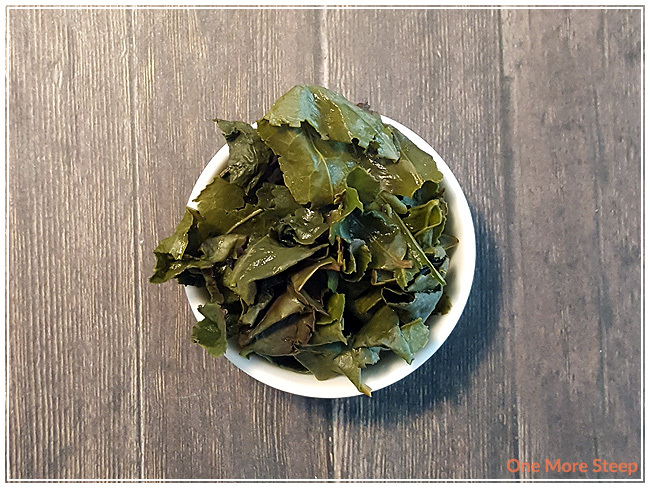 The colour of the oolong deepens to a more golden yellow with the first three resteeps, and the creamy quality of the tea gets more pronounced. I feel that the floral notes started to take a backseat to the buttery quality of the tea by around the third steep. By the ninth steep, the tea leaves were really beginning to be exhausted of most of the flavour. 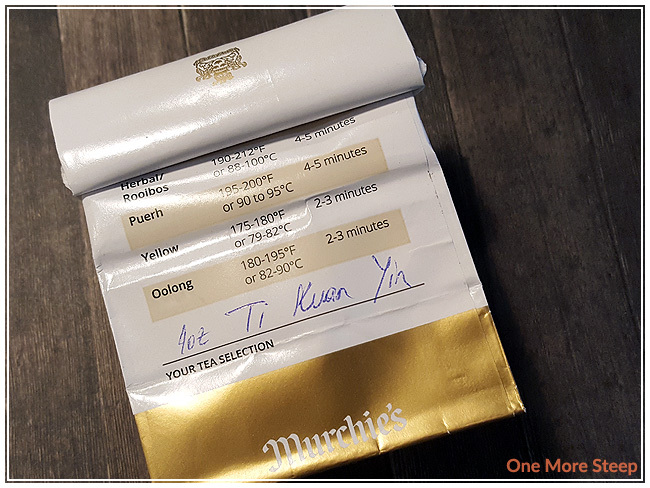 I loved Murchie’s Ti Kuan Yin Oolong. I am a sucker for a good tea, and while the initial price of the Ti Kuan Yin may have given me a little bit of sticker shock (since I had to double to price in my head to consider it as I usually buy my teas in 50g quantities), there is a very good value to this tea. The simplicity of the initial steep is just a hint of what’s to come, this is a tea that I would highly recommend resteeping over and over again because it gets more interesting and has a much more complex flavour profile than you might initially think if you go by the first steep only. 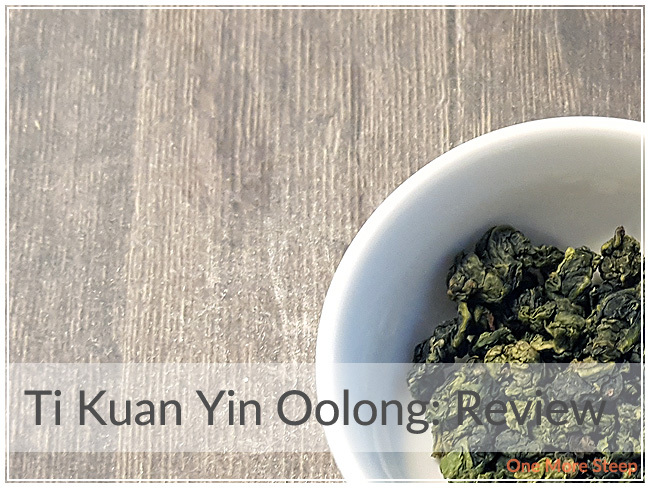 While I love floral teas, I find that the later steeps of Ti Kuan Yin do not disappoint as the floral notes wane a bit and allow the buttery creaminess of the tea to become more and more pronounced.